Bobbi Panter take me away!! No this is not a Calgon commercial, but it’s close! As an owner of 3 Shih Tzu’s I am always in serach of the perfect shih tzu shampoo that not only cleans, but doesn’t cause skin irritations. A couple of weeks ago when I was at SuperZoo in Las Vegas I was scouring the showroom floor looking for a shampoo that would knock my socks off. As fate would have it I turned a corner and saw two beautiful Shih Tzu’s on a banner… yes I have to admit I am a sucker for great advertising so I had to know more. 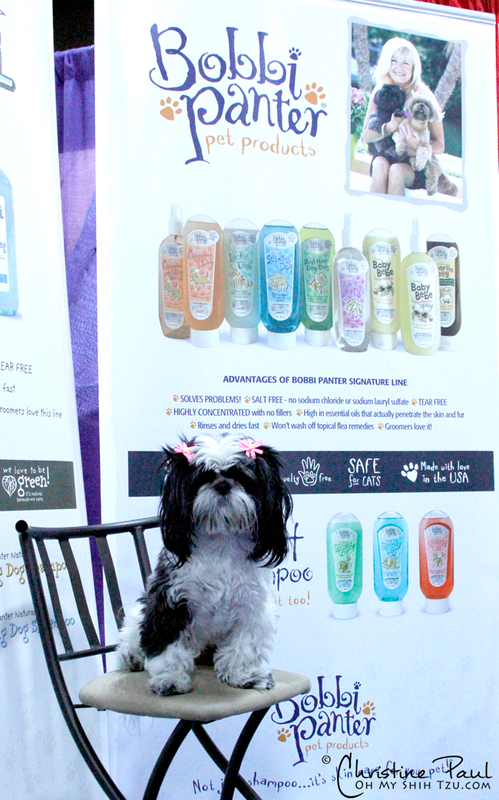 I learned five very important things about Bobbi Panter Pet Products. First, the shampoos were developed to solve problems, and aptly named, such as Stinky Dog, Bad Hair Day Dog, & Itchy Dog. Second, the shampoos are salt free which means that you get faster rinse and dry times. Salt is a cheap filler that some companies use to thicken their shampoos, there’s none of that in Bobbi Panter Pet Products! Third, the shampoos contain essential oils and are highly concentrated which mean a little goes a long way. Fourth, the products are Ph balanced so they are tear free. 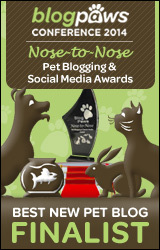 Fifth, Bobbi Panter pet products are ‘Made in the U.S.A’!!! Once I returned home, it was time to test out Itchy Dog on little Katie. Katie suffers from food allergies and seasonal allergies, basically a little girl that is itchy all the time. Her hair tends to be on the dry side, but after a day or two will become very greasy. In the following pictures on the first is Katies hair up close. As you can see it is very dry looking, yet a little greasy. The second, Katie waiting for the shampoo! The third picture shows how wonderful and luxurious the shampoo is, giving a nice creamy lather. After a very quick dry by towel & blow dryer, the results are amazing. In addition to Katie testing out the Itchy Dog, Riley and Trixie have been using the Gorgeous Dog and the results are amazing also. Besides leaving your dogs hair shiny and smooth our favorite thing about Bobbi Panter Pet Products is how easily they rinse out. With previous products once a desired lather is achieved and worked in I always had trouble with the rinse, but not with Bobbi Panter. One rinse of water and the shampoo is GONE!!! LOVE IT!! I normally try and wash Katie once a week, this time we were able to go a bit longer, approx 10 days from the first bath with Itchy Dog to the second… her hair did not grease up or get dry like an alfalfa stalk. Though I think this is one of the best Shih Tzu Shampoo’s it is great for all dogs! We give Bobbi Panter Pet Products 4 Paws!! or additional benefits for this review. Bobbi Panter Pet Products supplied Riley & Katie with a free product to try. We love Bobbi Panter too! I know Bobbi, Bebe and Cece personally! I use the Itchy Dog because of my allergies and I have never had flaky skin since. They are by far the best natural dog shampoos available. Love Dolly. Pee S: You all look gorgeous! Great tips Shih Tzu Mommy. Debby, my product, Itchy Dog. Since your dog is already very itchy, leave it on a few extra minutes to soak in. The essential oils that I selected and being a salt free shampoo, it will get into the skin and fur to give your pom/corgi mix relief. Contact me if you have any futher questions. Thanks so much we just love your products!! Now I know to leave on the shampoo a few minutes to get the full benefits of the essential oils. I have a very itchy pom/ corgi mix. We have used antihistamines and a medicated vet prescribed shampoo. Nothing helps! Do you think this shampoo might help? She can’t enjoy this, and keeps me up at night scratching. Thanks for any thoughts!